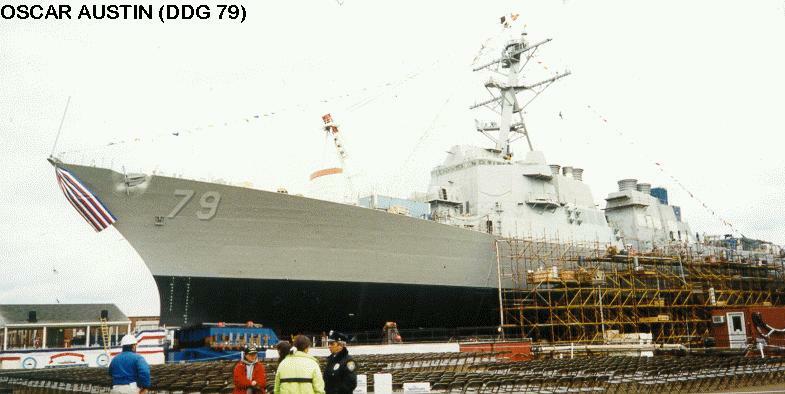 On 7 November 1998 Bath Iron Works launched Oscar Austin (DDG 79), the 17th Arleigh Burke (DDG 51) class AEGIS guided missile destroyer to be built by BIW, and the 29th ship of the class. 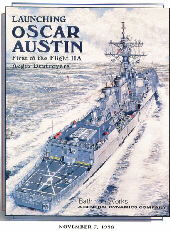 Oscar Austin is the first of the Flight IIA variant of the class, the most significant upgrade to the class to date. The most significant change associated with Flight IIA is the addition of dual helicopter hangars aft, on either side of the after VLS. Other upgrades to the ships' aviation capabilities include addition of Recovery Assistance, Securing and Traversing (RAST) helicopter hauldown systems on the flight deck, relocation of the helicopter control station, and additional berthing for a full aviation detachment. 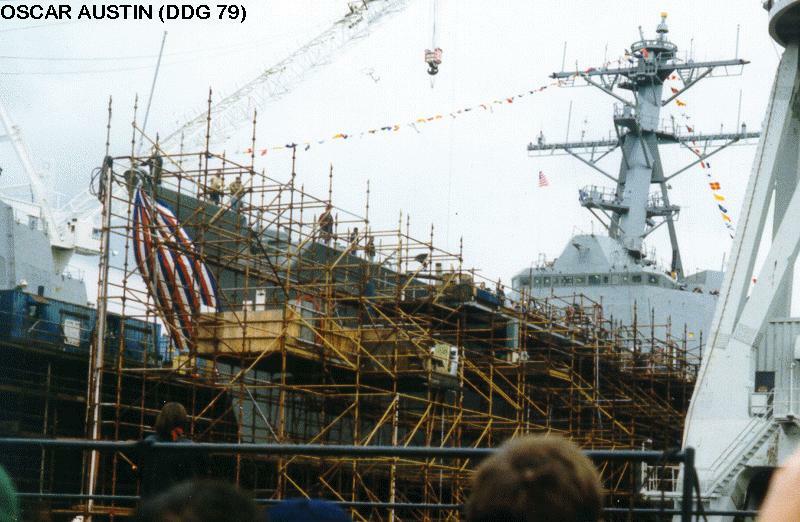 To accommodate these changes there have been numerous other alterations, including raising the aft VLS and aft SPY-1D radar faces by one deck level, relocation of the Mk32 12.75 inch torpedo tubes, deletion of Harpoon missiles and the SQR-19 towed array, and extensive internal rearrangements around the helicopter hangars. 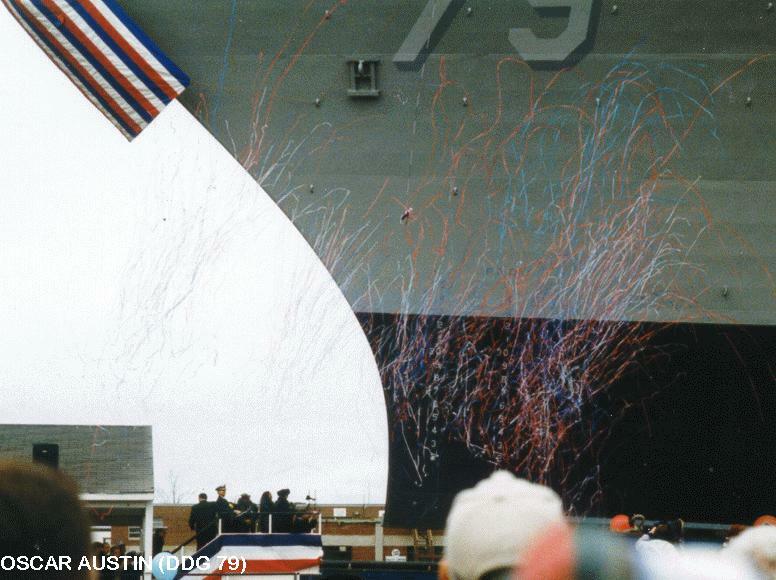 While Oscar Austin is the first ship of a new era, she is also one of the last ships of an old era - the era of ways-launched ships at BIW. 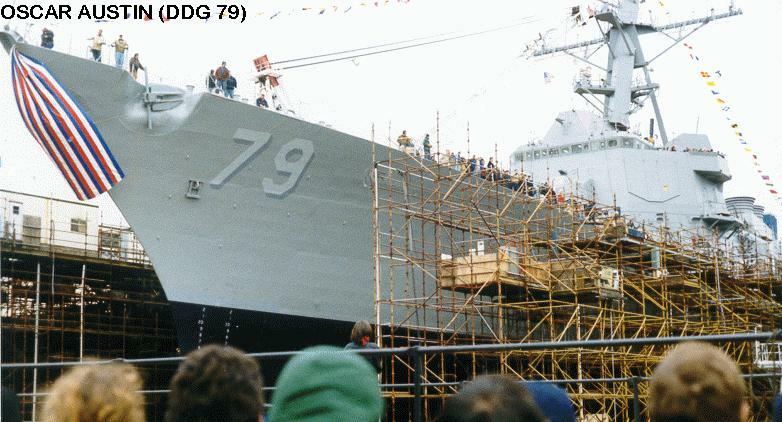 In the last 114 years over 400 ships have been launched from BIW's inclined shipways, but after DDG 79 only four more ships will be built and launched on the ways. 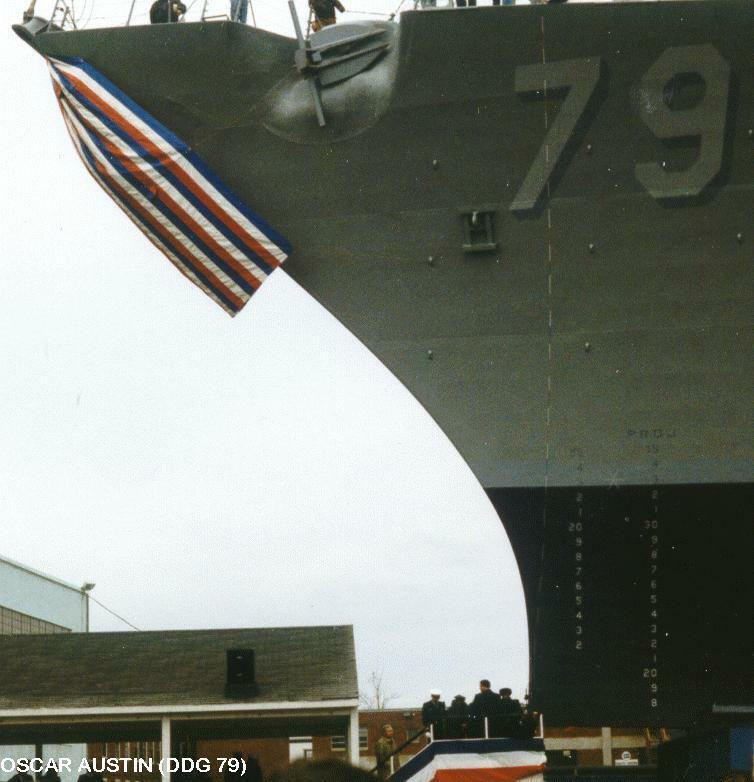 Hours before DDG 79's launch, a separate ceremony at the other end of BIW's yard marked the start of construction on the Land Level Transfer Facility, a completely new construction and launch facility scheduled to replace conventional shipways at BIW. 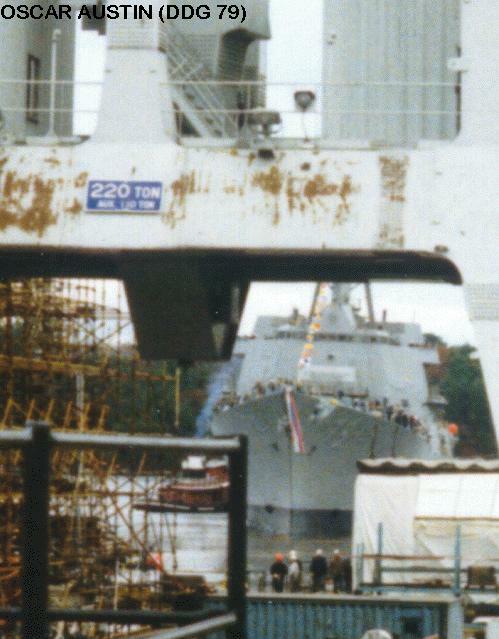 Starting with DDG 90, scheduled to be laid down late in 2000, BIW ships will be built on a large, flat expanse of concrete, and launched by drydock. This new facility and new construction techniques are expected to result in significant improvements in efficiency and productivity. 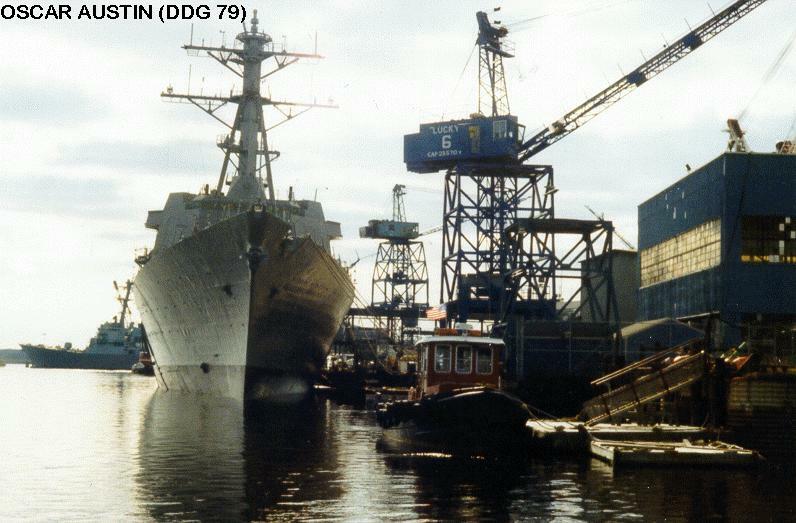 Oscar Austin (DDG 79) is named for PFC Oscar Austin, USMC, who was killed near Da Nang, Vietnam, on 23 February 1969. According to the launch program, "PFC Austin's obervation post came under a fierce ground attack by a large North Vietnamese force using a heavy volume of hand grenades, satchel charges and small arms fire. Observing that one of his wounded companions had fallen uncounscious in a position dangerously exposed to hostile fire, Austin unhesitatingly left the relative security of his fighting hole and, with complete disregard for his own safety, raced across the fire-swept terrain to drag the marine to safety. As he neared his companion, he observed an enemy grenade land nearby. Leaping between the grenade and the injured marine, Austin took the full force of the explosion himself. Although he was badly injured, Austin turned to help his fallen companion and saw a North Vietnamese soldier aiming a weapon at the unconscious man. With full knowledge of the probable consequences, Austin threw himself between the injured marine and the hostile soldier. In doing so, he was mortally wounded." PFC Austin's mother, Mrs. Mildred Austin, was Matron of Honor at the launch ceremony. Her granddaughter, Miss Monique E. Hart, was the Maid of Honor. The Ship's Sponsor was Mrs. Dianne F. Reason, wife of Admiral J. Paul Reason, Commander in Chief, U.S. Atlantic Fleet, who was the Principal Speaker. Front cover of the official launch day program. This view emphasizes the major distinguishing feature of the Flight IIA DDGs, the addition of dual helicopter hangars, and other associated changes. BIW artwork by James E. Stilphen. Oscar Austin the morning of the launch. The new helicopter hangars are barely visible aft, behind the massive staging. 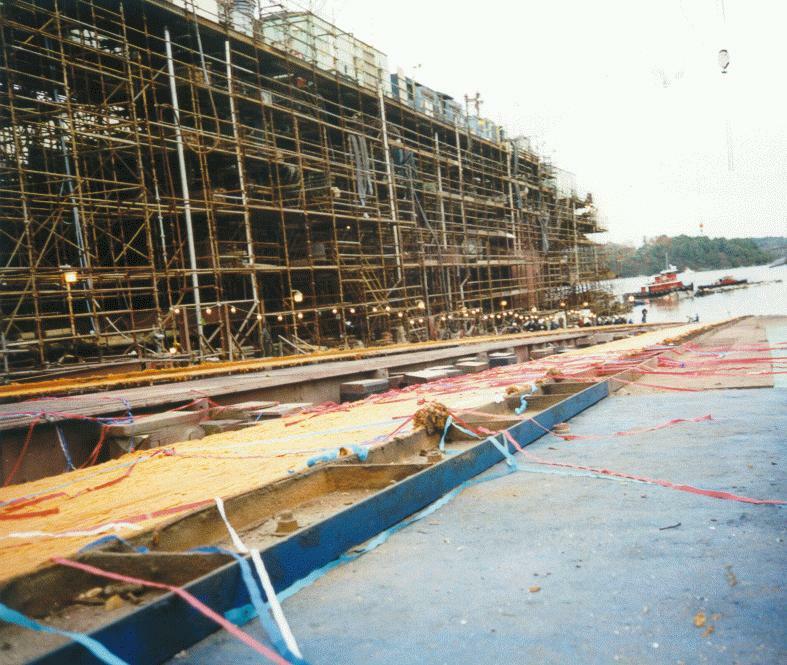 The large blue structure beneath the ship's bow, known as the bow poppet, will support the forward part of the ship during the launch, especially at the critical moment when the stern floats off the ways, while the bow is still sliding towards the river. A closer view of DDG 79's bow towering over the speakers' platform. 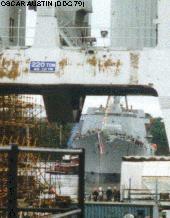 BIW's #11 crane is at right; the #15 crane is beyond the ship. 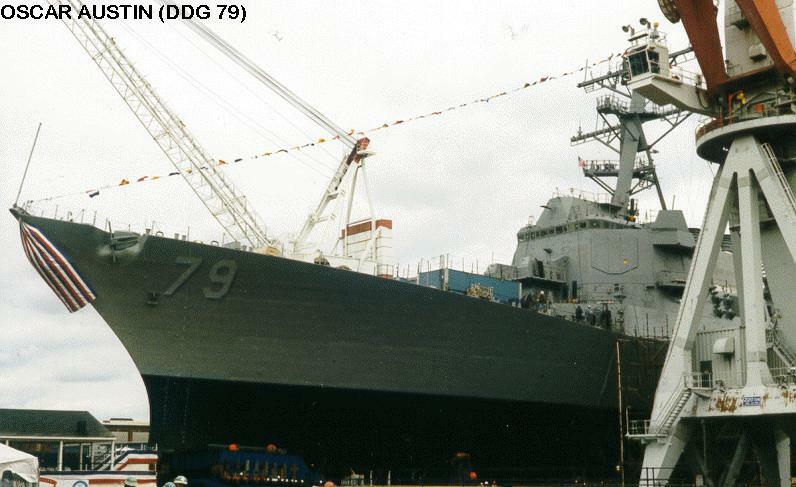 A close-up view of DDG 79's main superstructure. 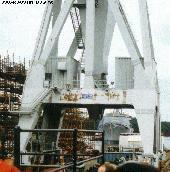 The raised "box" directly above the bridge wing is the englarged structure to house the port aft SPY-1D panel in its new, elevated position. 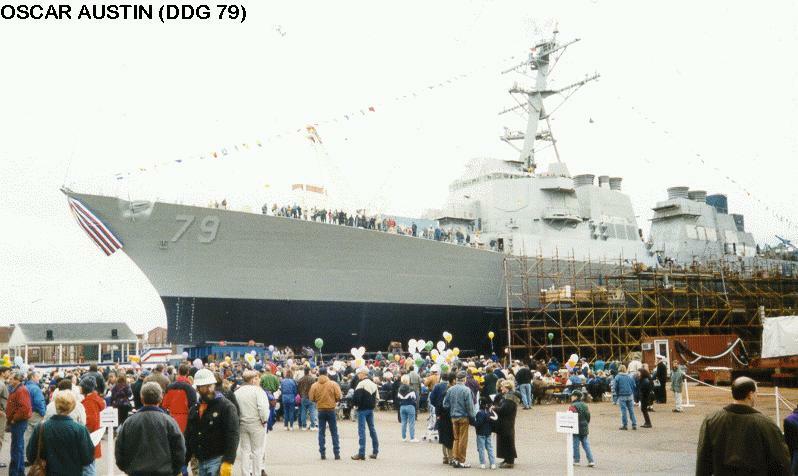 The crowd gathers below DDG 79 shortly before the start of the launch ceremony. The Ship's Sponsor, Matron of Honor, and Maid of Honor on the christening platform moments before christening the ship. "I christen thee Oscar Austin!" Seconds after the christening, Oscar Austin begins to slide down the ways, as streamers fly. ...and is waterborne. Looking between the legs of the crane, Oscar Austin is afloat and clear of the launch cradles, as tugs move in to take the ship in tow. 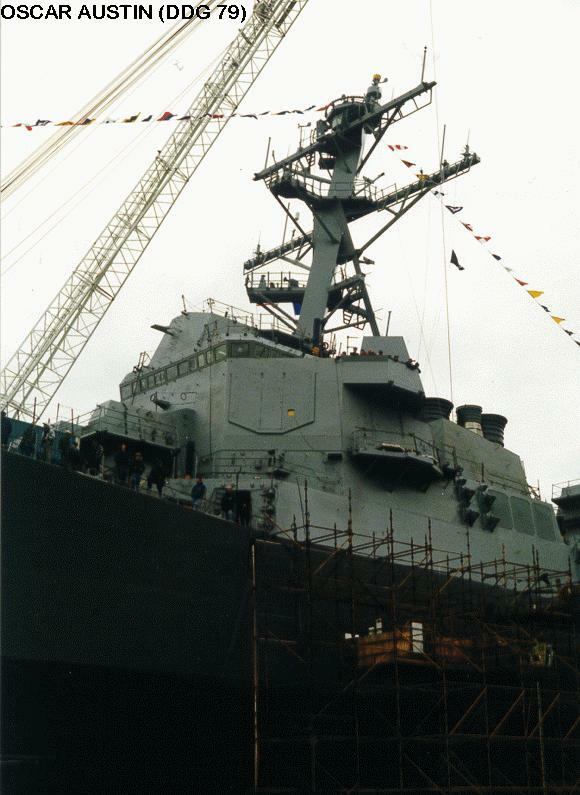 An englarged view looking between the crane legs, as DDG 79 floats for the first time. The tugs begin to turn DDG 79 for the short trip to BIW's North Dock. Streamers and grease litter the ways minutes after the launch. Tugs are pushing the the launch cradle and bow poppet towards shore, as the cranes move in to lift the equipment from the river. The next day Oscar Austin rests at BIW's North Dock. 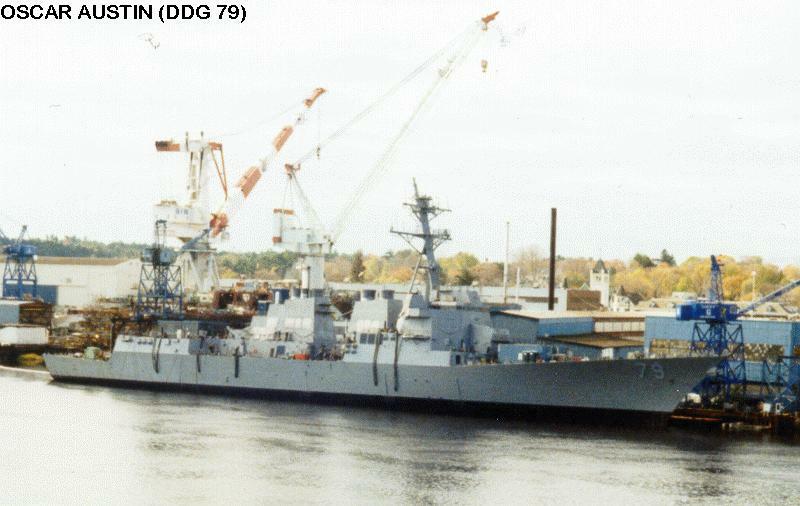 Winston S. Churchill (DDG 81), BIW's next ship, is under construction beyond Oscar Austin; her stern and helicopter hangar can be seen above Austin's hangar. 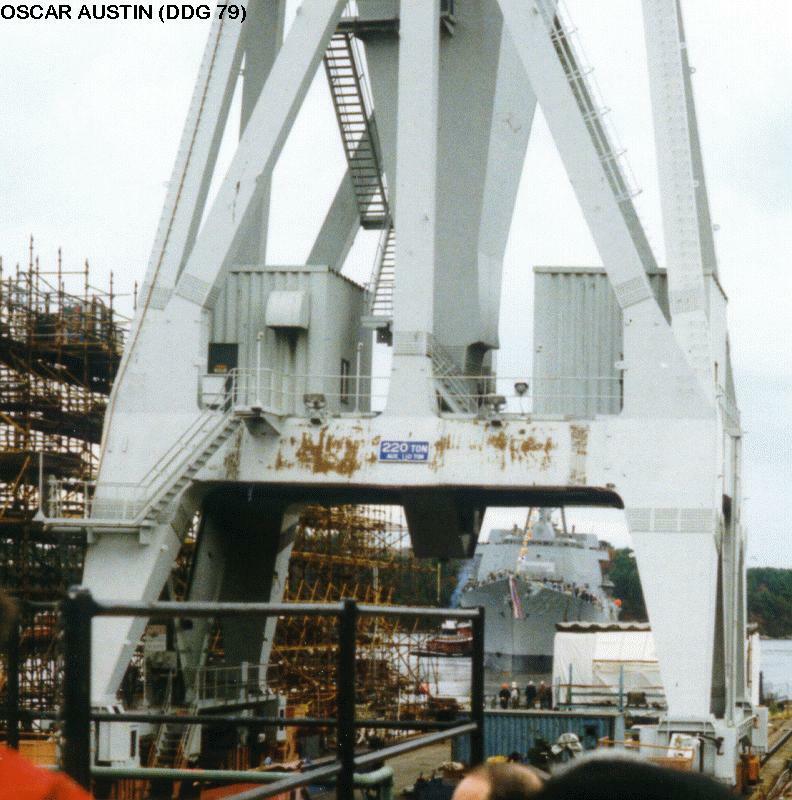 A water-level view of Oscar Austin the day after her launch. 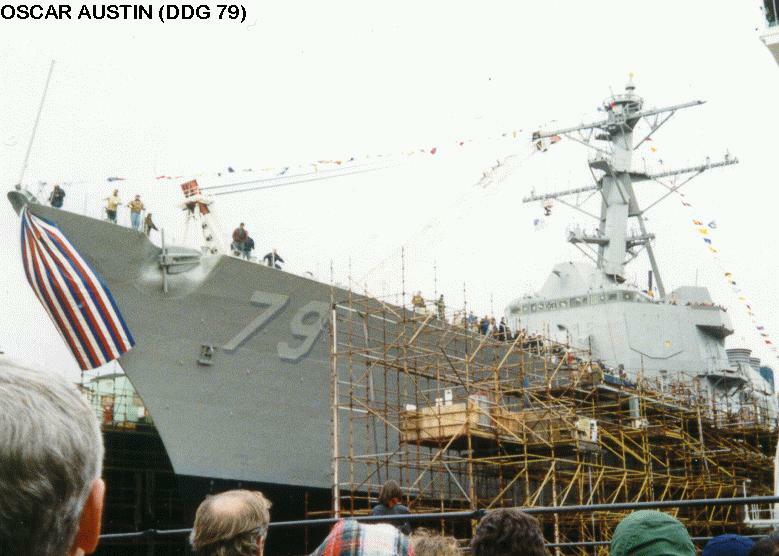 Higgins (DDG 76) is visible to the left of Austin; O'Kane (DDG 77) is hidden behind Austin. 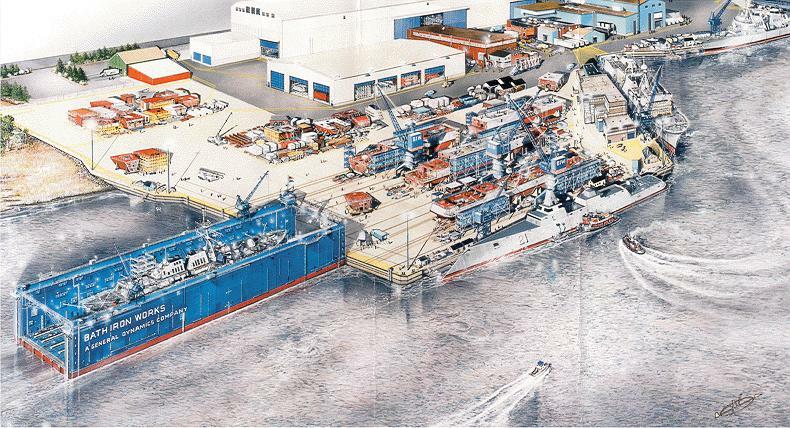 Artist's concept of the new Land Level Transfer Facility, which will replace conventional shipways at BIW in 2000. BIW artwork by James E. Stilphen.